Cyclone Separator is simply fabricated construction from M.S. /S.S. material. 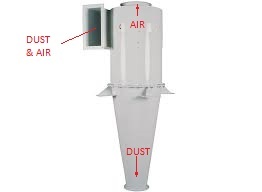 In this, air entry is tangential so, due to tangential entry of air there is cyclone produce in cyclone separator and all heavy dust particles are fallen in bottom of hopper and clean air remove from the top of cyclone. Also, we can supplied multi cyclone as per customer requirement.